While Ben is off learning about Microsoft Azure and implementing PBI on actual project work, I have decided to run a number of test cases that compare Tableau to Power BI using data that I happen to have on-hand. One of my goals is to keep the evaluations concise, while at the same time demonstrating software performance, features and capabilities. Although I am not explicitly including Alteryx in this particular evaluation, there is a nice workflow shown in this article (in the included video) that I developed tonight to reduce a big geospatial data set down to a more manageable size for this testing. I recently began doing some volunteer work for Path.org (for more info on Path, please see this article). As part of this work, I was given topographic data from Zambia, Africa. The high-resolution topographic data set originated as a shapefile, which my friend Dudley and I have transformed into various forms for different reasons. Through the magic of Alteryx and some fancy computational mathematics via Dudley, this non-uniform data set was transposed into a triangulated interconnected network (TIN) that represents the mathematically optimized topographic surface as shown in Figure 1. This surface will be used to visualize water flow across the land surface. Figure 1 – The mathematically optimized topographic surface, which was written out as 68.4M interconnected triangles. This is just the southern region of Zambia. 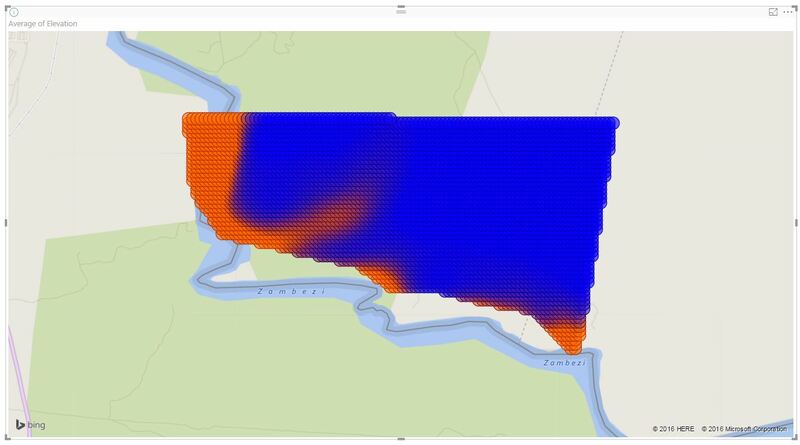 Using Alteryx, I cut-out a fairly small section of the data along the southern boundary (390K triangles out of 68.4M triangles) to compare the graphical rendering abilities of Tableau and Power BI. This region was provided to me by one of the best Tableau mappers, Mr. Allan Walker (aka, Walker Texas Ranger). Although Chuck Norris might have been a more accomplished actor than Allan, Allan definitely has the best Scottish accent of the two! 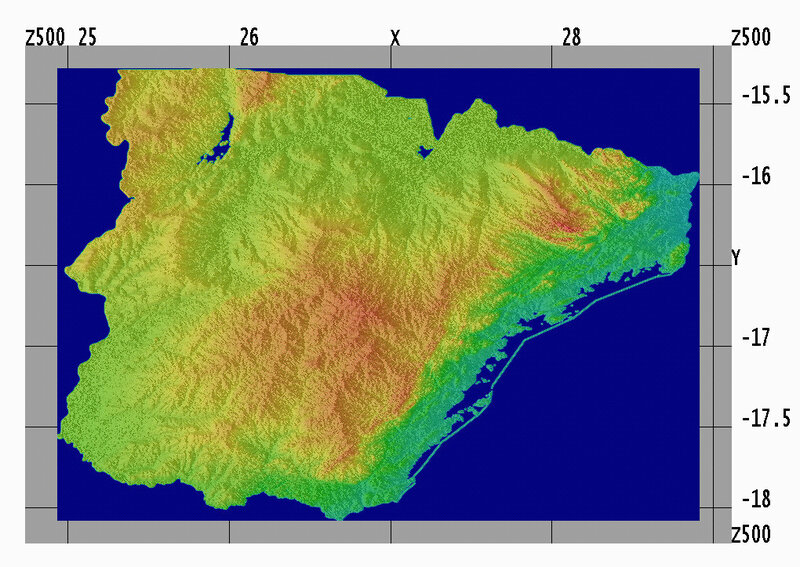 This test was performed to visualize the topographic surface of the region shown in Figure 2. The Aleryx workflow shown in the upcoming video took me about an hour to complete because I had to learn how to use some new tools. Learning new techniques makes doing this kind of work fun. Figure 2 – The Livingstone test area along the southern boundary, which includes Victoria Falls. The shaded yellow region is the area where we will be visualizing the topographic data. This southern region of Zambia includes the magnificent Victoria Falls as shown in Figure 3. Victoria Falls is shown near the lower right corner of the yellow shaded area in Figure 2, along the Zambia River. 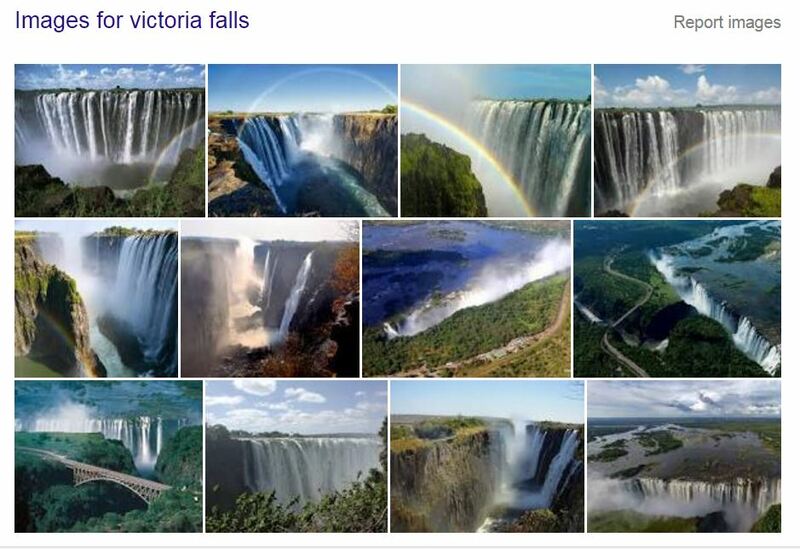 Figure 3 – Images of Victoria Falls, Zambia, Africa. This work didn’t take me long to do, so I made a movie of the actual working procedures to show how the two software packages performed in visualizing the topographic data. For simplicity, I’m going to show the movie and let you be the judge of the software performance. 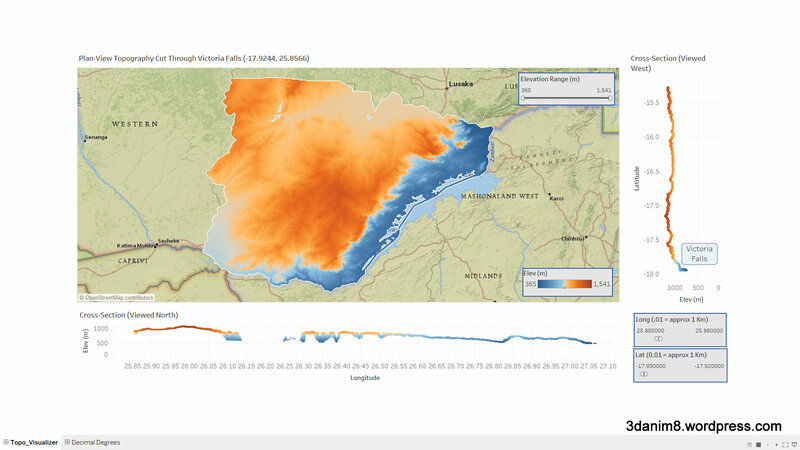 The final topographic maps produced by Tableau and Power BI are also shown at the end of this section. After watching the video, I realized that my Power BI inexperience could have had some impact on the overall impression of the work. I realized that the topographic region seemed incomplete and the colors were not correct in Power BI. It was while watching the video that I realized that only the lower right corner of the map got drawn because it appears that Power BI has a limit on the number of points it currently can render. In other words, the Power BI map includes a small portion of the topographic surface. I also could not determine how to reduce the dot sizes or change the plot type to a shaded polygon. I’m not sure if some of these problems could be rectified by a more experienced Power BI user. I also think Power BI will likely perform better once ArcGIS integration is finished, as shown in Figure 4. 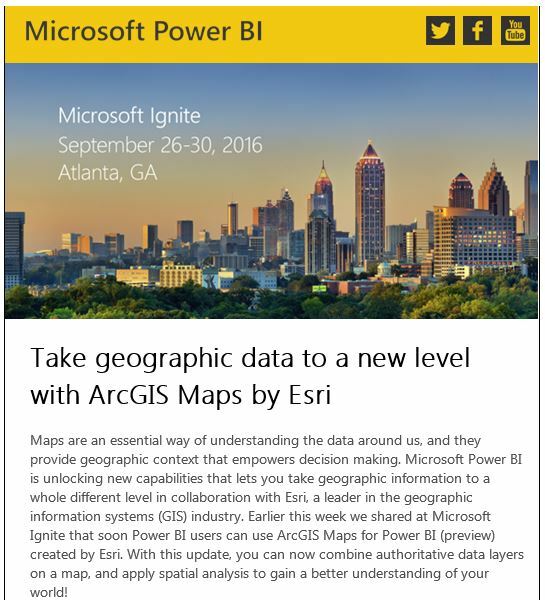 Figure 4 – A recent announcement of ArcGIS integration in Power BI. 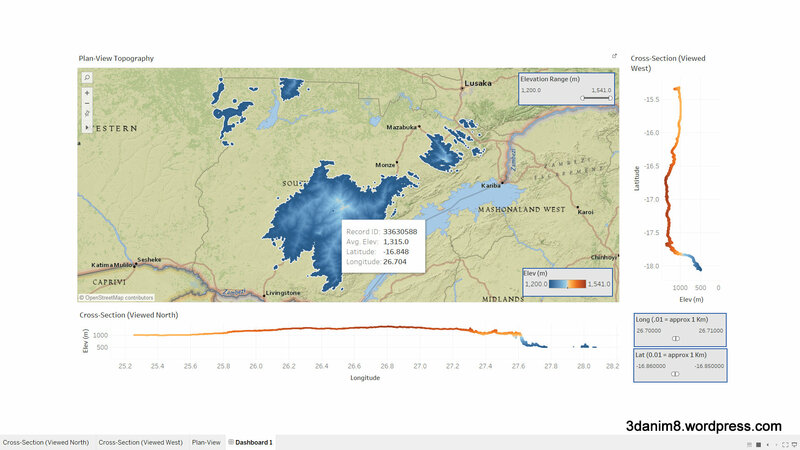 Figures 5 and 6 show the resulting topographic maps from Tableau and Power BI. These maps were drawn with a single point (average elevation) placed at the centroid of each triangle. 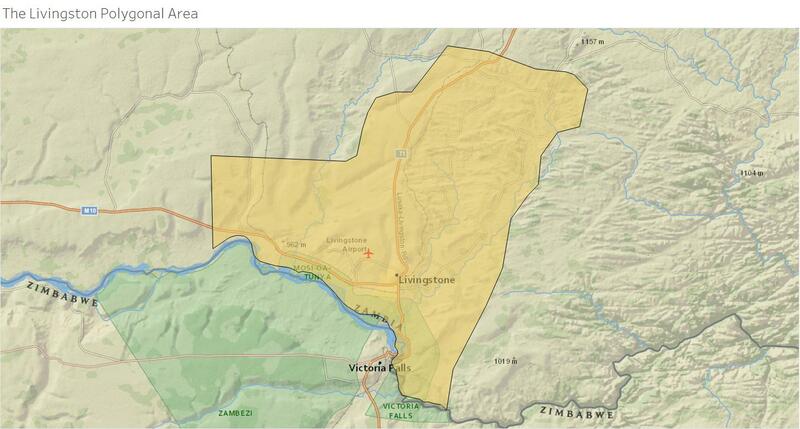 With over 390,000 centroids, it appears Power BI was not able to complete the rendering with only the very lower right corner of the map being completed (near Victoria Falls). Figure 5 – The Tableau topographic map in the Livingstone area. 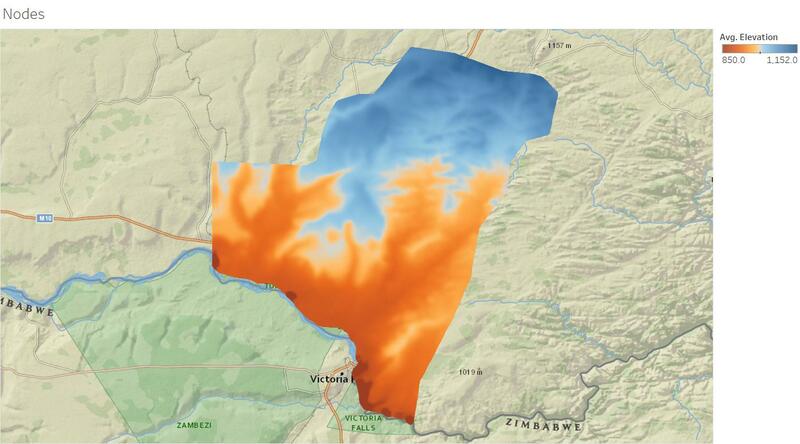 Figure 6 – The Power BI topographic map in the Livingstone area. I spontaneously decided to do this comparison tonight after I wrote the Alteryx workflow that was shown in the video. There was no pre-planning or strategizing before I did the work. For this reason, if someone more skilled than me can do a better demonstration of this data with Power BI, I’ll be happy to send you the data set so that you can teach me how to work more efficiently with the tool. I plan on doing more tests like these because they help me learn Power BI capabilities while at the same time giving us insight into the strengths and weaknesses of each package. When you talk about strengths, consider these final graphics (Figures 7 and 8). Tableau is rendering 34 million data points in each of three frames, with filters operating in each of the three separate panels. 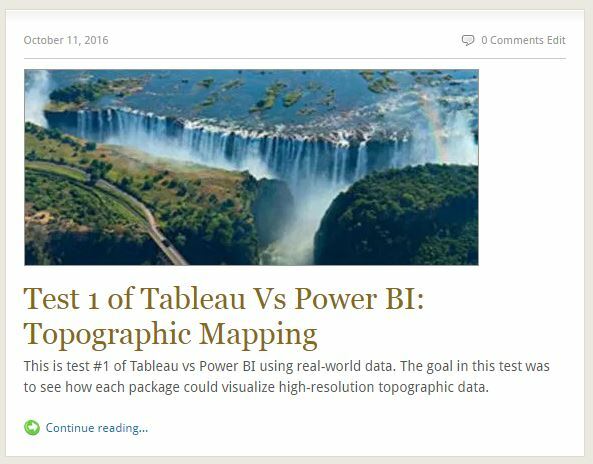 This means Tableau is managing to render potentially over 100M data points. Figure 7 – The Tableau Topo Visualizer for Southern Zambia. In this case, only elevations about 1200 m are being shown in plan view. Figure 8 – The vertical sections were cut through Victoria Falls. Is Tableau perfect? No, not by a long shot. I could give them dozens of suggestions on how to improve our ability to generate dashboards like this one. Then again, I’ve been doing work like this a long time and I understand what it takes to make software better and more functional, especially from an environmental/scientific perspective. There are many technical improvements needed in the data presentation and the dashboard set-up and functionality for this example. Thanks for this comparison. I’ve noticed that Microsoft products tend to have a predefined limit that is hard-coded. For example the 32,000 point limit for a chart in Excel or 255 dataseries. Meanwhile Tableau seemingly lets you reach for the stars (so to speak) with only your hardware limiting you. For example I have a Tableau dashboard that may crash or throw a warning on my 4GB laptop, but it works wonderfully in my 32GB desktop. Great series Ken. Also, one topic per post is easier to follow than the previous “Impressions From Our First Month” post, which had many different comparisons to digest. Keep it up. This is an impressive comparison test, Ken! I’ve been using Tableau for about 2 years and only recently tried PowerBI. I have to admit I was impressed. Thanks for sharing this!